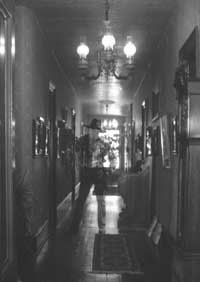 On November 8, 2008, Alliance Studying Paranormal Experiences (ASPE) will host guest speaker Ed Sitzberger, who will present a program about his experiences with ghosts and other paranormal activities during the years he owned the St. James Hotel in Cimarron, NM. The event will take begin at 2:00 pm at the Angel Fire, NM Community Center, with an admission charge of $4. Sitzberger was born and raised in a house across the alley from the St. James Hotel, which was built nearly 150 years ago. "My friend and I used to play in the hotel when we were not at my house," said Sitzberger. "I graduated from high school in Cimarron, served in the United States Air Force and then graduated from the University of Colorado with a degree in Mechanical Engineering. I retired from the University of California after having worked in a career in engineering until 1987 at the Lawrence Livermore National Laboratory and the Los Alamos National Laboratory," Sitzberger continued. "I bought the St. James Hotel in 1985 and moved back to Cimarron." Sitzberger owned the St. James from 1985 - 1993. "This is the right time of the year for ghosts and goblins and all things spooky," said ASPE founder Janet Sailor. "The St. James Hotel is famous throughout the world for its paranormal activities, and that makes Ed Sitzberger is the perfect guest speaker for a program about such things," Sailor continued. "Come with questions and your own spooky experiences to share with others -- we'll turn the lights down and tell ghost stories until we're all scared spitless!" ASPE is a NM non-profit corporation comprised of curious and committed folks whose goal is to document, study, preserve and present paranormal experiences. ASPE compiles information about experiences involving all facets of the paranormal, and those who have had such experiences are invited to report them to ASPE in either a personal interview or by filling out an online form at www.aspefiles.org. ASPE plans for Fiscal Year 2008-09 include additional events featuring paranormal experts, excursions to paranormal sites, and public forums geared toward educating the general public about the subject. Long-range plans include hosting a tourism-friendly Paranormal Symposium in the autumn of 2009.